ARCCA’s engineers have years of experience with full vehicle testing and component testing. 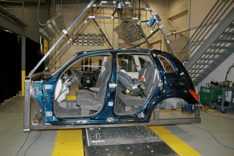 Testing on crashworthiness cases can involve a vast variety of tests types, the most common of which are full vehicle crash testing, horizontal accelerator testing, and structural push/pull testing. In addition, biomechanical testing closely relates to crashworthiness, since such testing studies the types and causes of human injury. Roof testing is conducted to evaluate the performance of a vehicle roof under drop or rollover conditions.